Update at 8:20 p.m. — Fairfax County Public Schools will be closed Wednesday. Earlier: A snow “grand finale” is sweeping across the Tysons area, after an afternoon that saw schools and some government facilities close early amid weather worries. Rain, sleet and snow fell, with the latter whitening the ground and untreated roads. Nearly 1.5 inches of snow had fallen on Vienna as of 4:45 p.m., the National Weather Service reported, and 2.3 inches had fallen by the time the flakes tapered off. The early dismissal for the federal government and others led to an early evening rush hour. 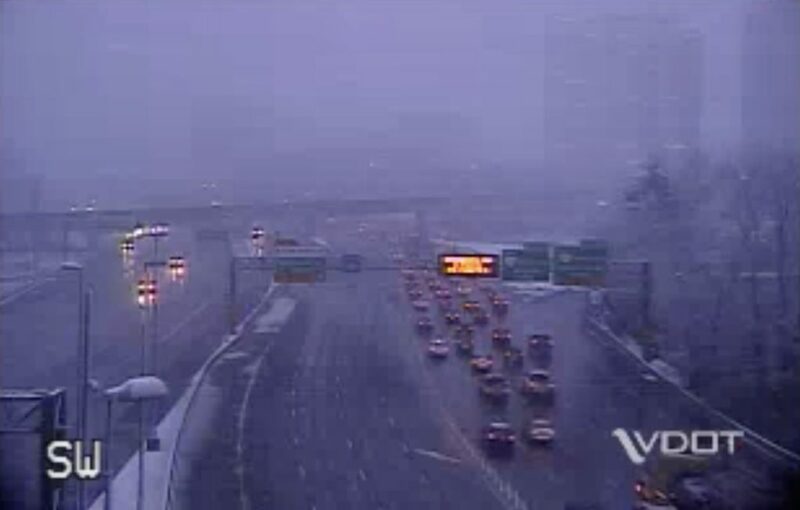 As of 5:30 p.m. traffic on the outer loop of the Beltway in the Tysons area was still heavy. The snow also led to some slippery spots on local roads, and a few reported crashes, though serious weather-related traffic jams were largely avoided. With the snow ending, the concern now turns to falling temperatures and potentially icy conditions overnight. More snowy images from around the area, and advisories from local governments, below.